Shirley June Fry Irvin (June 30, 1927) was a World Number 1 American female tennis player who was born in Akron, OH. Fry won every Grand Slam event in both singles and women’s doubles. She is the champion of the 1951 French Open, 1956 Wimbledon, 1956 US Open, and the1957 Australian Open. Fry is just one of 15 people to have won the career Grand Slam. 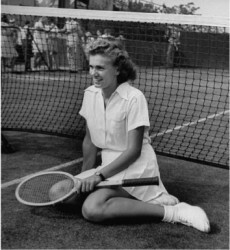 Victorious at every Grand Slam event in singles and women’s doubles, Shirley Fry built a reputation for congeniality and fair play that would extend well beyond her playing years. Her success was attained largely on the strength of her formidable ground strokes, but she was highly competent at the net and a sound strategist. Her flexibility was apparent throughout her productive career, and she won and lost with extraordinary equanimity over the years. Gamesmanship was not an option she had any interest in exploring. Fry was inducted into the International Tennis Hall of Fame in 1970.